The main difference between Frank Mason, Josh Hart and Caleb Swanigan is that the first two play for teams projected to win their conferences while the third does not. But Purdue is still good. And Swanigan is undeniably great. And he belongs right beside the Kansas and Villanova stars in all conversations about legitimate National Player of the Year candidates. In other words, when you look at these updated CBS Sports National Player of the Year rankings, don't think of Mason, Hart and Swanigan as first, second and third. Think of them as ... 1A, 1B and 1C. Because I really do believe this race is that close. Everything remains totally up in the air, far as I'm concerned. Mason got 21 points in Monday's win at Kansas State, made a tremendous steal after leaping into the seats, and is now averaging 20.4 points, 5.1 assists and 4.3 rebounds for a Kansas team that remains alone atop the Big 12 standings. The senior point guard is shooting 50.6 percent from the field and 51.9 percent from 3-point range. He's averaging 23.3 points in KU's past four games, which includes victories over Baylor and Kentucky. Hart finished with 26 points in Saturday's win over St. John's, then added 25 more in Tuesday's win over Georgetown that pushed the Wildcats' record to 23-2. The senior guard is now averaging 19.2 points, 6.6 rebounds and 3.4 assists in 33.3 minutes per game for a Villanova team on pace to win its fourth straight Big East title and earn a No. 1 seed in the NCAA Tournament. He's shooting 51.4 percent from the field and 40.6 percent from 3-point range. Swanigan recorded his sixth straight double-double and 20th of the season in Saturday's win at Maryland. The sophomore forward is now averaging 19.1 points and 12.8 rebounds for a Purdue team that's 19-5 and tied for second with Maryland in the Big Ten standings. He's shooting 54.7 percent from the field and 50.0 percent from 3-point range. Ball averaged 18.0 points, 6.0 assists and 6.5 rebounds in the two games since these rankings last updated and is now averaging 15.1 points, 7.8 assists and 5.8 rebounds for a UCLA team that's 21-3 with a win over Kentucky at Rupp Arena. The freshman point guard is shooting 54.1 percent from the field and 43.0 percent from 3-point range. His 7.8 assists per game are second only to Creighton's Maurice Watson, who is out for the season with a torn ACL. Happ got 20 points and seven rebounds in Sunday's win over Indiana and is now averaging 14.7 points and 9.1 rebounds for a Wisconsin team that seems headed toward a Big Ten title. The sophomore forward is shooting 61.5 percent from the field. He has eight double-doubles -- including a 28-point, 12-rebound effort in last month's win at Minnesota. Baylor's two-game losing streak hurts Motley's place in the national conversation, fair or unfair. 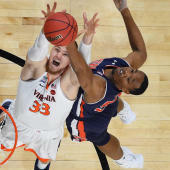 But he's still averaging 16.2 points and 9.8 rebounds for a team that has the nation's best RPI and nine top-50 wins. The junior forward is shooting 50.8 percent from the field. He's scored at least 15 points in six straight games. Williams-Goss finished with 33 points, seven rebounds and four assists in last Thursday's win over BYU and is now averaging 15.6 points, 5.7 rebounds and 4.8 assists for the t0p-ranked Zags. That BYU game represented the Washington transfer's second 30-point game of the season. He's shooting 50.5 percent from the field and 87.7 percent from the free throw line. Thornwell got 44 points and 21 rebounds in Tuesday's game against Alabama -- an impressive performance regardless of the fact that it came in a very strange four-overtime loss. The senior guard is now averaging 20.4 points and 7.7 rebounds for a South Carolina team that's tied atop the SEC standings with Kentucky and Florida. The Gamecocks are 16-2 in games in which he's played. Monk has scored at least 23 points in four of his past six games and is now averaging 21.9 points for a Kentucky team that's tied with South Carolina and Florida atop the SEC standings. The freshman guard has eclipsed the 40-point mark once and the 30-point mark three times. He's shooting 41.6 percent from 3-point range. Kennard is averaging 20.0 points during Duke's three-game winning streak and 19.8 points, 5.2 rebounds and 2.6 assists on the season. The sophomore guard is shooting 53.1 percent from the field, 45.8 percent from 3-point range and 85.0 percent from the free throw line. He's scored at least 34 points in a game three different times. THE NEXT TEN (in alphabetical order): Dwayne Bacon (Florida State), Joel Berry (North Carolina), Bonzie Colson (Notre Dame), De'Aaron Fox (Kentucky), Josh Jackson (Kansas), Justin Jackson (North Carolina), Jock Landale (Saint Mary's), Lauri Markkanen (Arizona), Donovan Mitchell (Louisville), Alec Peters (Valparaiso).